Sustainability reporting has moved from a practice undertaken only by pioneers to become standard practice for thousands of the world’s largest companies, the majority of which are using the Global Reporting Initiative’s (GRI) Guidelines as a basis for their sustainability reports. While GRI has long been accepted as ‘de facto standard setter’ in providing sustainability reporting guidance, formal recognition of its pre-eminence in this field has yet to be acknowledged. GRI intends to strengthen the independence of the governance of GRI’s standard and equip the organization to be recognized as fit for public reference as a standard setter and to meet the particular requirements that regulators tend to have of officially referenced standard setters, while maintaining the core multi-stakeholder approach that is key to the legitimacy of GRI. GRI submitted the intended changes to its governance for public feedback to receive commentary on whether these changes will strengthen the independence of the governance of the GRI standard and equip the organization to meet the requirements that policy makers and regulators tend to have of officially and publicly referenced standard setters. Specific reporting organizations, government representatives and regulators were invited for targeted interviews. In parallel, all draft constitutional documents were made publicly available and the general public was invited to provide specific feedback and commentary on the organizational changes of the organization; and whether those changes would fulfill the objective for GRI to be fit for official and public reference as a standard setter. We have pioneered sustainability reporting since the late 1990s, transforming it from a niche practice to one now adopted by a growing majority of organizations. GRI’s Sustainability Reporting Standards are foundational to this success. 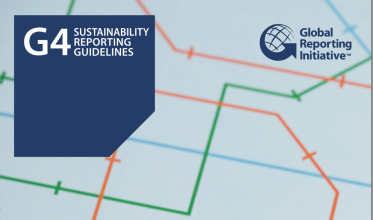 With thousands of reporters in over 90 countries, GRI provides the world’s most widely used standards on sustainability reporting and disclosure, enabling businesses, governments, civil society and citizens to make better decisions based on information that matters. In fact, 93% of the world’s largest 250 corporations report on their sustainability performance. ​Our vision is to create a future where sustainability is integral to every organization’s decision making process. ​As part of our new strategy, we’ve developed the GRI brand to capture our vision, mission, and beliefs. The connected dots of the GRI logo, which form the shape of the world, symbolize the important elements of our organization – connectivity and collaboration. We believe that we need a global perspective to change the world, and in the power of a multi-stakeholder process and inclusive network. Our new logo is an amalgamation of all those beliefs and values.